Labor day, 2006 started out with Gary and Helen leaving for Oregon pulling their new, but used travel trailer purchased only a couple weeks earlier for the trip. Four days later we arrived in St. Helens, OR at Jac Harbour's home. Jac met us at her front door holding Callie, our new 8 week old female black standard poodle born July 10, 2006. The next morning Jac set up a training day a few miles north of town. Dogs present beside Beau and Scout were Sur, Callie's sire, Cheers, and Tugs. Sylvia with her poodle Katrina (named prior to the storm) rounded out the group. We all had a very productive water training session. We camped in the Harbour's field for 3 nights getting to know Callie, Jac, and her husband. We left for home the following Sunday morning arriving back in Minocqua Wednesday evening. The trip home went extremely well. Callie quickly accepted riding in her crate without a lot of fuss for the trip. She even slept through the night in the trailer her first night out. It wasn't always that quiet but for the most part we all had three good night's rest. Callie is officially AKC and UKC registered as Tudorose Blk Forest Calla Lily. She's been completely accepted by Beau and Scout although she does drive them nuts at times chewing on their ears and tails. She knows she's the boss. 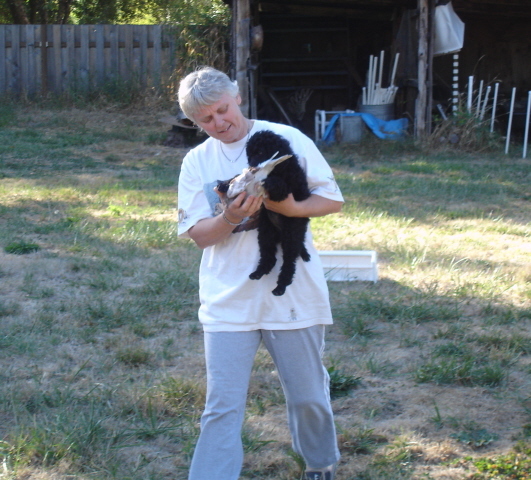 She picked up right where they started as pups, retrieving and loving birds. She has no fear of water, loves it, leaping entries, lots of speed, style, perseverance, and is learning to mark well on doubles and triples. She went along with Beau and Scout the fall of '08, hunting in South Dakota. Once she realized what was up I gave her the chance to hunt alone. 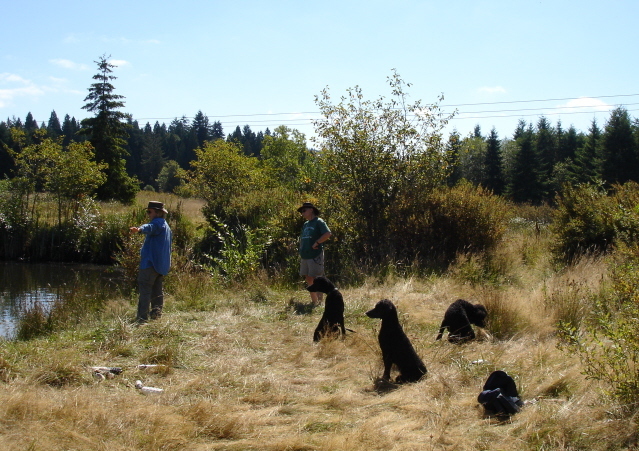 She scent trailed, flushed and retrieved her first solo rooster in short order. After that Beau and Scout were lucky to get a retrieve. 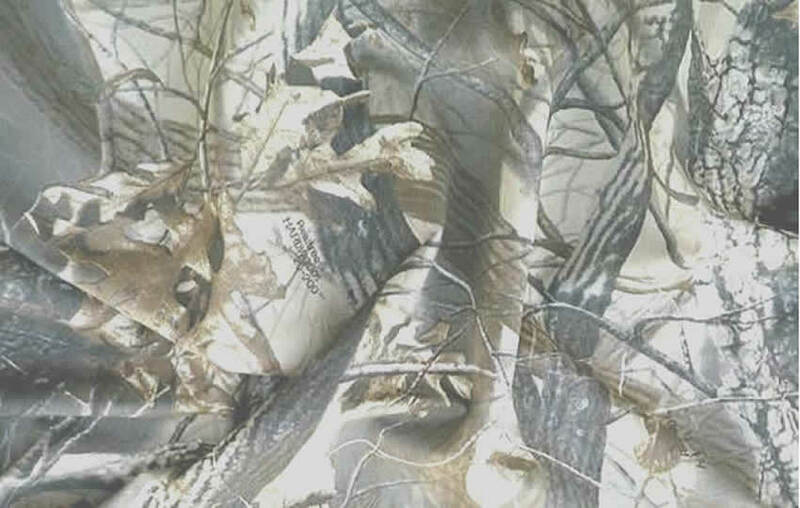 You can also read about Callie's first experience hunting at a WI shooting preserve on the Journal page under Big Rock, 07. In the picture to right at that preserve she learned that birds are not only fun to flush but also neat to carry and retrieve. 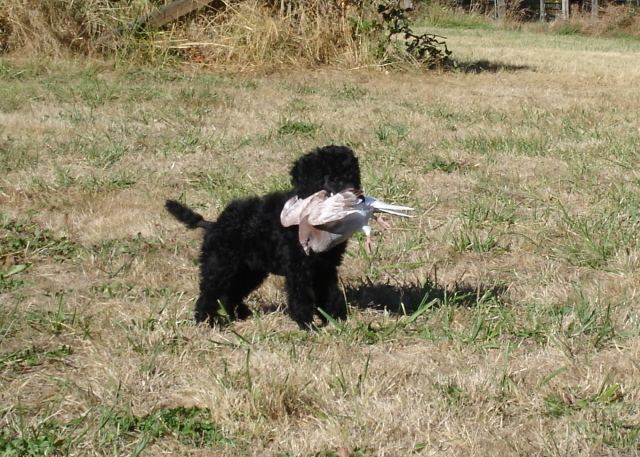 Callie with her Chukar. 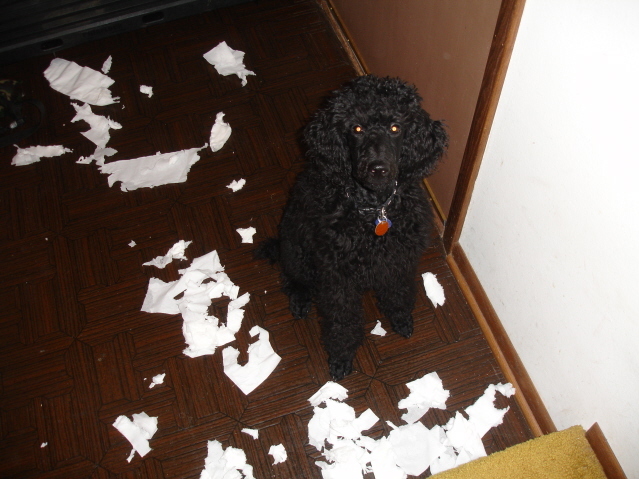 Since then she has learned all the basic obedience rules, the ground work needed for a well mannered field poodle. As you can see from this old photo she still needed more training. Since this TP episode she finished tied for 3rd. in her first obedience class consisting of 12 other dogs. Not bad for a six month old pup. At her second obedience class she finished first. She's now four and has received her UKC Started Hunting Retriever title, plus the PCA WC and WCX titles. She also has the AKC CGC award and a TDI title. CGC stands for Canine Good Citizen and TDI for Therapy Dog International. The WC consists of two back to back single retrieves of ducks on land and water. The WCX is back to back double retrieves on land and water with an honor. I've now got her passing Hunt Tests and close to ready for the more advanced tests. She is already very good hunting for real with three years of experience in the Dakotas. We believe and have been told by those in the know that Callie definitely meets the conformation standard and would do well in the show ring but for now that's not in the cards. 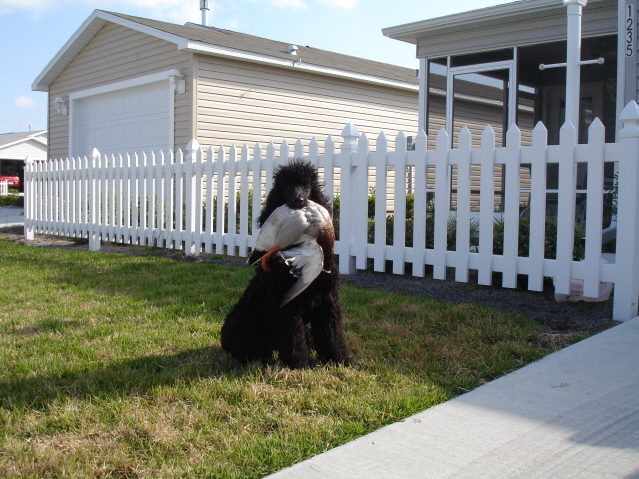 Here, after a Feb. training session in FL, '07, Callie was 7 months old and already doing well with her field training. She's nuts over live pigeons and has no problem retrieving ducks or pheasants. I'm still in the process of training the double T and swim-by. All that's left in the transition phase. I'm not in any rush since she is already a natural hunter. The winter of 2010 in TX she was doing long single and double water marks with leaping entries; triples on land, marking them extremely well, showing style, drive, and hunt perseverance. 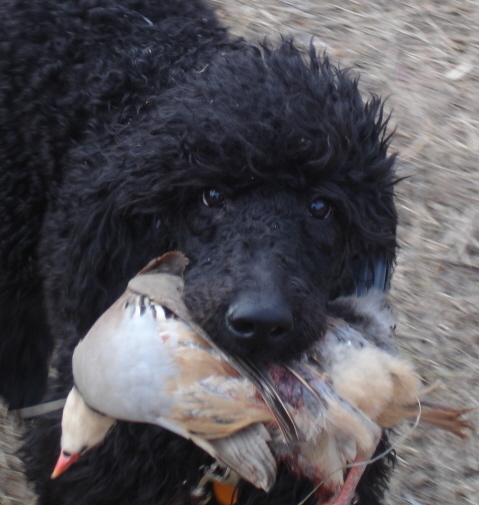 Callie received her Started Hunting Retriever title in Texas during March of 2010. She also received her Therapy Dog International certification in the Fall of 2010. Callie and Helen go to Avanti Health and Rehabilitation in Minocqua twice a week. She also goes to the Lac Du Flambeau Public School two days a week as a "Tail Waggin' Tutor" for some of the first grade students. Callie and Helen began an adventure last April by signing up for agility classes in Eagle River, WI, at the Northern Wisconsin Canine Center. The class is taught by Nicole Belmore a wonderful, patient teacher. Although Callie has not competed in an agility trial yet, she and Helen might be ready for it in the Spring or Summer of 2013. We hope to have some pictures of Callie during classes. We are waiting to get some really nice outside pictures. If you check their website you will see that the outside is beautiful in the Summer. She is truly graceful over the jumps and follows hand and body signals, better than Helen gives them. Above we talked about her obedience training as it relates to field work, her "sit-stay" had to be secure before much could be done with agility. It is one of the things that Nicole stresses the dog must be good at before it can be trained in agility.